Our away game against Wilshire 3rds began with an early and cold Sunday morning drive to Melksham. Upon arrival, the sports hall proved to be as cold, if not colder than outside. Despite this the match got off to a blistering start, with our regular singles representatives Emily, Hester and Kris, along with singles new face Seb providing a 4-0 advantage. 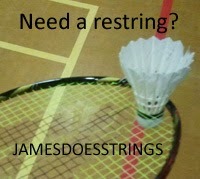 This was in spite of Seb conveniently ‘misplacing’ his entire badminton kit (not his fault of course). Our good run continued with the duo Kahoo & Seb winning both doubles comfortably and Dave & Kris just losing out to Wiltshire’s 1st pairing. Our ladies contributed, with Jan & Lynda beating Wiltshire’s 2nd ladies and Emily & Hester replicating their performance. Both couples lost to Wiltshire’s 1st pairing but with the match win guaranteed at 9-3, only one mixed was required to obtain the full 3 points. Both Seb & Jan and Dave & Emily brought home a comprehensive victory, with Kahoo & Lynda losing respectably to talented opposition. The early morning wake up proved to be worthwhile with Cornwall securing 3 points to maintain their position at the top of the league and potentially promotion at the end of the season. A great team effort by the Cornish seconds. The County Final of the Badminton England National Schools Badminton Championships took place at Carn Brea Leisure Centre Pool on Wednesday 27th February. 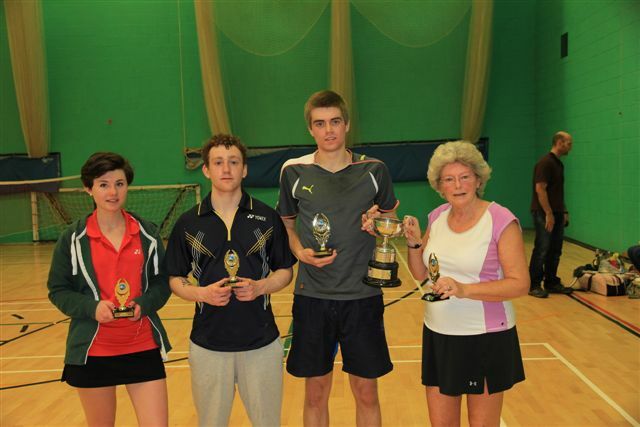 A total of 64 players from across the County competed for the County Title and progression to the Regional Finals at Exeter University on March 14th. Eleven Schools were represented across the age groups, Mounts Bay, Humphry Davy, Camborne, Roseland, Poltair, Bodmin, Fowey, Penryn, Truro, Launceston, Callington. All Teams having won through their local rounds over the last few weeks. The standard across the competition was of a high standard and some closely fought matches ensued. All these schools will represent Cornwall on the 14th March when Teams will be aiming to go the final hurdle and represent the South West Regional at the National Finals in April. Thanks must go to Truro and Penwith College and Launceston College for providing Leaders to assist with the smooth running of the event,and Carn Brea for use of their excellent facilities. Cornwall badminton's premier event for under 11 players had a good entry of both boys and girls attend the championships at Truro School. The games were keenly contested with many close matches between the enthusiastic players. Three groups of players contested the boy’s singles competition. Each game was played to 15 points and there were many close games with notable performances from Alfie Hammersley and Charlie Fox. However, it was Alfie's older brother Sam who qualified to play William Freer in the Final. It was a fantastic achievement by Sam to reach the final who was struggling with a cold. The final did not disappoint the packed sports hall with a high level of badminton on display from both players. The eventual winner was William Freer who built upon his recent win in Devon and won in 3 ends 12-15, 15-8, 15-11. The boys who did not progress through the group stage were entered into a plate event, which threw up some interesting clashes and was well fought out by all players. A close final, with fantastic play, saw Sam Phelps beat Ethan Walsh 15-11. Two groups of players competed for the girl’s singles event with Cara Collins and Charlotte Freer winning through to the final. There were some fine displays and close games within the group phase with a notable performance from Mollie Bailey who only lost one game. The girls final saw Cara Collins build upon her success in Plymouth with a win over her doubles partner Charlotte, 15-6 15-13. Both girls played to the peak of their ability to create an entertaining match. The girl’s singles plate saw Molly Pritchard meet Naomi Cavill in the final. A notable performance in the plate event came from was Issy Walsh who reached the semi-final then was out pointed by Molly. Yet another close final saw Naomi Cavill beat her doubles partner Molly 15-12. The doubles events had 1 group for boys and 1 group the girls with all pairs playing each other for the trophy. In the boy’s doubles event, the closest game of the day was contested between Ethan Walsh and Sam Phelps against Harry Dyer and Charlie Fox with the latter winning through 15-13. The William Freer Sam Hammersley pairing won all their games and took the winner’s trophy with Harry and Charlie taking the runners up honour. The girl’s doubles events provided many close matches, with the game of the day between Issy Walsh and Holly Crabb narrowly losing to sisters Mollie and Rebecca Bailey 15-13. The eventual winners were the pairing of Cara Collins who partnered 8 year old Charlotte Freer, who added another competition victory to their recent open tournaments successes. Naomi Cavill partnered Molly Pritchard to take the runners up berth. The mixed competition commenced with two groups of players pairings, with the winners of each group fighting it out for the final honours. Siblings William and Charlotte Freer won through group 1 to set up a final against group 2 winners Harry Dyer and Cara Collins. The final provided a real warming treat to the crowd in freezing conditions in the sports hall. The rallies were long and highly technical with Harry and Cara eventually winning through 15-9, 16-14 against William and Charlotte. The days play was enjoyed by both players and spectators and provided Cara Collins with a hat trick and William Freer with a brace of victories during the day. Family badminton success spans generations. Saturday the 2nd of February saw the well established Newquay Cup badminton tournament played at the Newquay sport centre. The mixed event has benefited from being widened to include separate draws for both affiliated league and social players, resulting in the highest entry for many years with one box of 6 pairs in the social event and 3 boxes of 5 pairs in the league. The social results were very close with just 19 points dividing the top three pairs. The experienced Martin Penny and Dee Frost managed to edge out their Camborne club colleagues Steve Knucky and Marnie Boston by just 4 points to take the runners up spot. However the event was won by the Camborne husband and wife pair of Mark and Della Griffiths who dropped just 1 point from their 10 ends to win in convincing style, and is their second consecutive tournament win having triumphed in the 2012 West Cornwall Bonanza in Truro. The league event was handicapped and saw a pleasing spread of players from various competitive clubs throughout Cornwall and Devon. The Tecans (Pool) pair of Steve Ellis and Kay Bossinger took all their ends, winning Group A by 7 points from the Mounts Bay pair and reigning champions of Lee Chapple and Hester Luke who also qualified for the semi finals as highest second placed pair. Group B was won impressively by Grandmother/grandson partnership of Jack Dyer and Jennifer Collins (First Edition), and Group C was won by the experienced Pair of Alison Philp and Andrew White (First Edition/Mounts Bay). 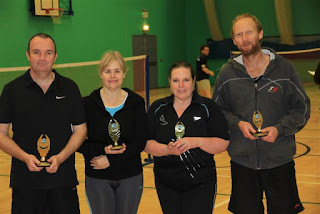 The semi-finals saw the handicaps reviewed for all and Lee and Hester produced their finest play with clinical and attacking play to account for Andrew and Alison in both ends. 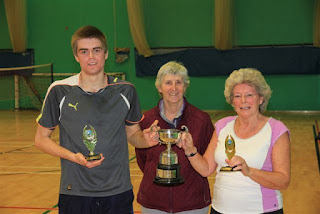 Jack and his grandmother Jenny again upset the odds by battling hard and defeating the much fancied pair of Kay and Steve by just 21-20, 21-20. The final was a tense affair with around 40 people watching the spectacle. Jack and Jenny showed great patience and defence in the first end with good holding and net play and fantastic pick ups, and whilst Lee and Hester played solidly they were unable to reproduce their semi final standard and could not make up the 8 point handicap losing 21 – 15. The second end was a much closer affair and despite Hester and Lee taking it 21 – 20 the cumulative points meant that Jack and Jenny lifted the title from the reigning champions. The wining pair which amazingly spanned three generations, proved to be popular victors as the crowd acknowledged the tremendous feat of grandmother Jenny managing to triumph over her considerably younger opponents. The event was well run, played in a great spirit and enjoyed by all. 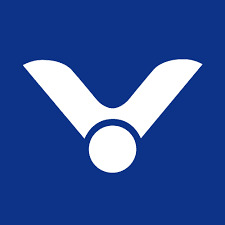 The organisers wish to thank the staff at the sports hall who kindly remained on in order for the matches to be completed.